Bradley Beal leads the way with 25 points including two key free throws down the stretch as the Wizards hang on to beat the Knicks, 106-103. John Wall added 24 points while Marcin Gortat was a perfect 7-7 from the field for 16 points as the Wizards avoid a #SoWizards collapse for their 48th win of the season. The Knicks were playing loose and freely throughout this one as they’d already been eliminated from playoff contention. New York started the game 6-6 from the field for an early 14-10 lead. Washington answered with a 10-0 run of their own highlighted by Wall weaving his way through the lane for a nice throw-down jam. 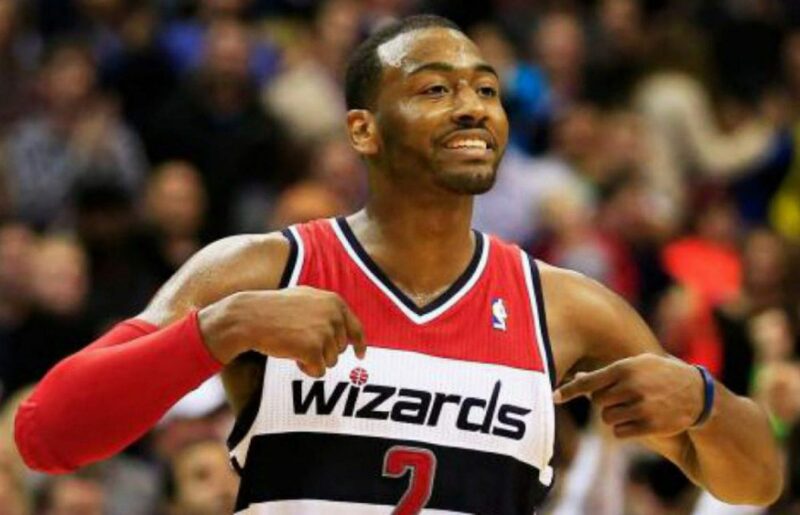 Wall was a perfect 4-4 from the field for 10 points as the Wizards led, 33-27 after one quarter. The feisty Knicks would not go away. New York put out a roster that resembled that of a D-League team but were able to keep the game within striking distance and climbed within three points of Washington in the second quarter. A late 6-0 run from Washington stretched the lead to eight, 59-51 at halftime. Beal and Gortat picked up where they left off connecting on their first shots of the third quarter while Wall was trying out some new And-1 moves against the helpless Knicks. The Wizards stretched the lead to 15, 71-56 and it looked like they might run away with this one. However, some hot shooting from Sasha Vujacic to end the third quarter had the Knicks within seven 82-75 entering the fourth quarter. Washington has been playing some bad defense as of late and it was on display in the fourth quarter. The Knicks went on a 7-0 run to cut the lead to two and suddenly, Washington was in trouble. After tying the game at 97, Wall drove for a layup and then drove for a monstrous dunk to put the Wizards back up four, 101-97. But unlike other lottery teams, the Knicks still have a star in Carmelo Anthony. Anthony scored six points down the stretch to tie the game. With under a minute remaining, Beal drove baseline and found Bogdanovic who kicked it back to beal for three as the Wizards took a 104-101 lead. Carmelo would brick a three-pointer as time was winding down as the Wizards escape with the 106-103 victory. Kelly Oubre continues his hot stretch off the bench this time, with 13 points and five rebounds. Once again, Oubre outscored Porter and received more playing time than Otto as Oubre was in for the entire fourth quarter. The second-year player was tasked with guarding Carmelo Anthony down the stretch and did about as good of a job as one could do. On the offensive end, Oubre stayed in attack mode both from three-point range and in attacking the hole. This is very reminiscent of Otto Porter who had his coming out party just prior to and during the 2014-2015 playoffs. After some tough games, Gortat got back in a groove on 7-7 shooting for 16 points. Gortat had a pretty favorable matchup as he went up against Willy Hernangomez for most of the evening. Regardless, it was nice to see Gortat get back in a groove. Washington led by 15 midway through the third quarter against a roster that might lose to some D-League teams yet they let New York back in this one. The Wizards only gave up 103 points, which is an improvement, but the defense is still not back. As a result, unlikely players caught fire and the Knicks were able to tie this game late in the fourth quarter. Fortunately for Washington, they were still able to get the win.